Binary Trust Method Review - Avoid the Scam! We decided to write this review when our readers complained about losing their money to a new scam known as Binary Trust Method. If you are still considering to sign up and fund your account, make sure you read our full Binary Trust Method review before you do something you’ll come to regret soon. Peter Olsen, the alleged co-founder of Binary Trust Method is the main culprit behind this scam. 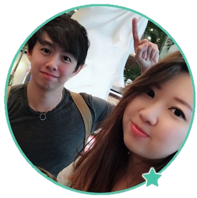 There are a lot of online scams preying on the internet population who wants to “get rich quick”, and Binary Trust Method is one of them. Throughout the presentation, Peter claims that he has helped a lot of people make at least $2100 on a daily basis, and now it’s your chance to grab the software. According to him, you don’t have to learn trading at all to start raking in thousands of dollars a day from the market. All you have to do is to sign up for the software, activate it, and start enjoying your new-found wealth. There are even members who recorded video testimonials to support Binary Trust Method – but can they be trusted? In the marketing world, it’s a well established fact that potential consumers are easily influenced by the testimonials of existing customers. Knowing this, the scammers behind Binary Trust Method decided to hire a few actors and actresses to record some fake testimonials. Yes, the testimonials you see above are completely fabricated, and we have the evidence below to prove our case. These fake testimonials were included in the sales material to make the scam appear legitimate. On the left, we can see the fake testimonial by “Natalie Wilson”, who claims to have made $134,720.09 using Binary Trust Method software. On the right we have the Fiverr profile for this actress. 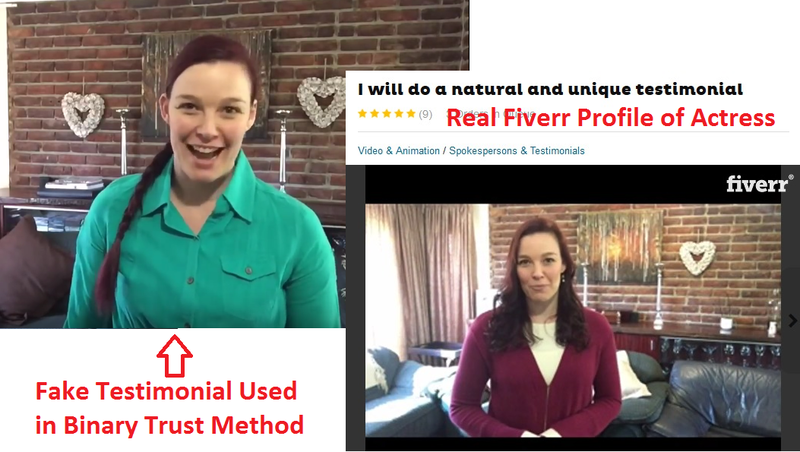 You can verify the authenticity of our claim by visiting her Fiverr profile here: fiverr.com/gferdi. We’ve also included her gig description here to let you understand what how the testimonials are fabricated. The clients (in this case Binary Trust Method) are instructed to submit a script, and she will read it like a piece of real testimonial. To her, reading off the script is just a job. She has not used the software before, let alone generating huge profits with it. 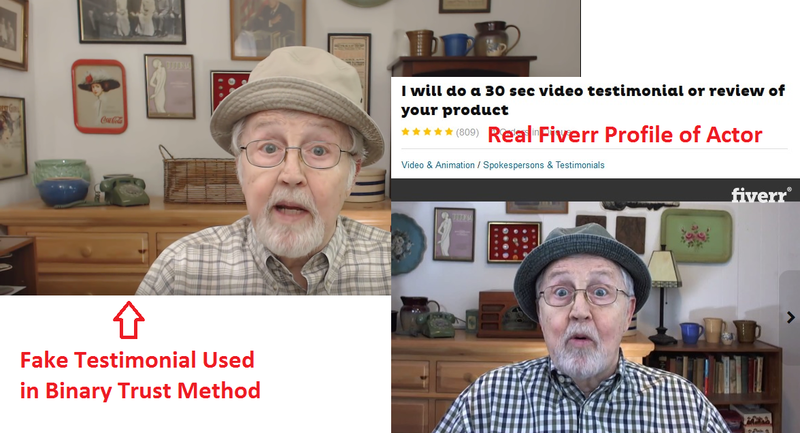 Once again, the Fiverr profile of the actor above can be found in this URL: fiverr.com/oldmansteve. Interestingly, the same Fiverr actor was also used in another online scam we have reviewed just days earlier in Fintech Limited. In Fintech Limited scam, his fabricated identity was “Kenneth Miller” instead of “James Peterson” as seen in Binary Trust Method. This shows that the same pool of actors and actresses are frequently hired by these online scams to deceive their victims. There’s no free lunch in this world. In the future, if you come across something that sounds too good to be true, you better stay away from it. Making money online takes real dedication and effort. How Does Binary Trust Method Make Money Off You? Online scams usually promise sky-high profits for minimal to no work at all. At the same time, their victims are always kept in the dark until they make the payment. When they finally realize they have been scammed, it’s always too late to get their money back. The same goes for Binary Trust Method scam. The truth is, the scammers behind Binary Trust Method are working together with a few unregulated brokers to make money off their victims. Firstly, Binary Trust Method convince their victims to sign up for the scam by promising at least $2100 daily profits. These victims are then registered with their partner brokers, which are all unregulated by monetary authorities. Once the victims fund their trading account, Binary Trust Method software will be activated to generated automated trades on their behalf. However, it is just a generic binary trading robot that generates random trades for the users. These victims typically lose all their deposits within hours of activating the software. The losses of their victims are pocketed by the broker, which is then shared with its partner-in-crime – the scammers behind Binary Trust Method. BINARY TRUST METHOD IS A SCAM. We strongly advise you to stay away from the scam if you don’t want to lose your hard-earned money.